Carleton Villa was designed by architect William Miller in c.1894 for William O. Wyckoff, who made his fortune helping the Remington Arms Company develop a market for the typewriter. The grand estate was originally designed as a summer residence and a spot for large entertaining. 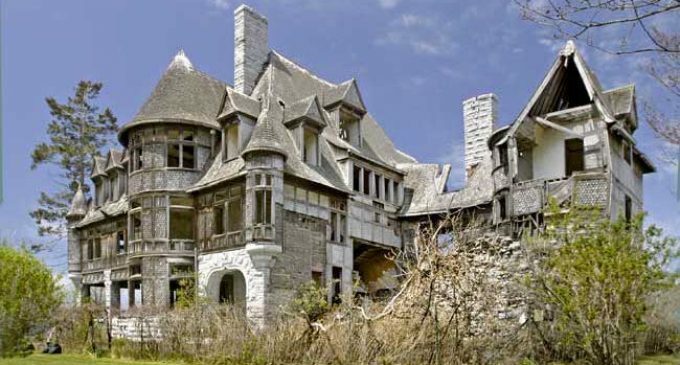 Located on Carleton Island where Lake Ontario flows into the St. Lawrence River, this was once the grandest estate in the Thousand Islands. Wyckoff’s wife reportedly died of a heart attack a month before he moved in and on his first night in the mansion he suffered a heart attack in his sleep and died. Wyckoff’s youngest son, Clarence Wyckoff, acquired the Villa after his father’s death. The family lost much of their fortune during the Great Depression and the home was sold to General Electric who planned on demolishing it to build a retreat & a new plant. They offered materials from the villa to those who would salvage them. Many of the windows, including stained glass, were removed and in the service wing an entire floor of a bedroom was cut out. The marble cladding of the tower base was also pulled off and taken away. Total demolition was halted when World War II intervened and GE abandoned the property as it was. The large tower was eventually pulled down when it started to pose a risk. The estate encompasses nearly 7 acres with gorgeous river views but will require a substantial fortune to bring it back to its former glory. The realtor who had listed Carleton Villa in the past said he has been trying to sell the prime waterfront property for years. “Over the past years, I’ve had many people interested,” said James Wiley, of Bowes Realty in Clayton, New York. “I have two or three inquiries on that property once every week.” Wiley said he’s had potential buyers from as far away as Australia and England and all over the U.S. express interest in purchasing Carleton Villa. “I get inquiries about it from all over the world.” It’s currently on the market for $495,000 with Barry Kukowski of Howard Hanna.